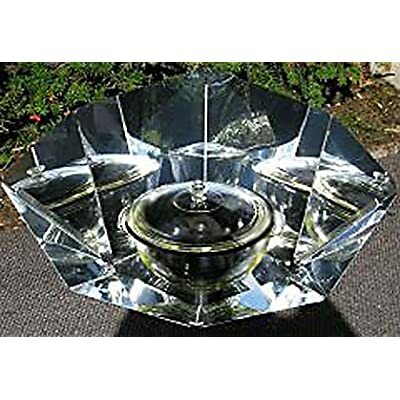 A solar cooker is a device which uses only sunlight to cook. Because they use no fuel and they cost nothing to run, humanitarian organizations are promoting their use worldwide to help slow deforestation and desertification, caused by the need for firewood used to cook. Solar cookers are also sometimes used in outdoor cooking, especially in situations where minimal fuel consumption or fire risk are considered highly important. Some examples of solar cookers are the Hot Pot Solar Cooker and the Sun Oven. Concentrating sunlight: Some device, usually a mirror, is used to concentrate light and heat from the sun into a small cooking area, making the energy more concentrated and therefore more potent. Converting light to heat: Any black on the inside of a solar cooker, as well as certain materials for pots, will improve the effectiveness of turning light into heat. A black pan will absorb almost all of the sun's light and turn it into heat, substantially improving the effectiveness of the cooker. Also, the better a pan conducts heat, the faster the oven will work. Trapping heat: Isolating the air inside the cooker from the air outside the cooker makes an important difference. Using a clear solid, like a plastic bag or a glass cover, will allow light to enter, but once the light is absorbed and converted to heat, a plastic bag or glass cover will trap the light inside using the Greenhouse Effect. This makes it possible to reach similar temperatures on cold and windy days as on hot days. Alone, each of these strategies for heating something with the sun is fairly ineffective, but most solar cookers use two or all three of these strategies in combination to get temperatures sufficient for cooking. Apart from the obvious need for sunlight and the need to aim the solar oven before use, using a solar oven is not substantially different from a conventional oven. However, one disadvantage of solar cooking is that it provides the hottest food during the hottest part of the day, when people are less inclined to eat a hot meal. However, a thick pan that conducts heat slowly (such as Cast Iron) will lose heat at a slower rate, and that combined with the insulation of the oven can be used to keep food warm well into the evening. The top can usually be removed to allow dark pots containing food to be placed inside. The box usually has one or more reflectors with aluminum foil or other reflective material to bounce extra light into the interior of the box. Cooking containers and the inside bottom of the cooker should be dark-colored or black. The inside walls should be reflective to reduce radiative heat loss and bounce the light towards the pots and the dark bottom, which is in contact with the pots. The inside insulator for the solar box cooker has to be able to withstand temperatures up to 150°C (300 °F) without melting or off-gassing. Crumpled newspapers, wool, rags, dry grass, sheets of cardboard, etc. can be used to insulate the walls of the cooker, but since most of the heat escapes through the top glass or plastic, very little insulation in the walls is necessary. The transparent top is either glass, which is durable but hard to work with, or an oven cooking bag, which is lighter, cheaper, and easier to work with, but less durable. If dark pots and/or bottom trays cannot be located, these can be darkened either with flat-black spray paint (one that is non-toxic when dry) or black tempera paint. 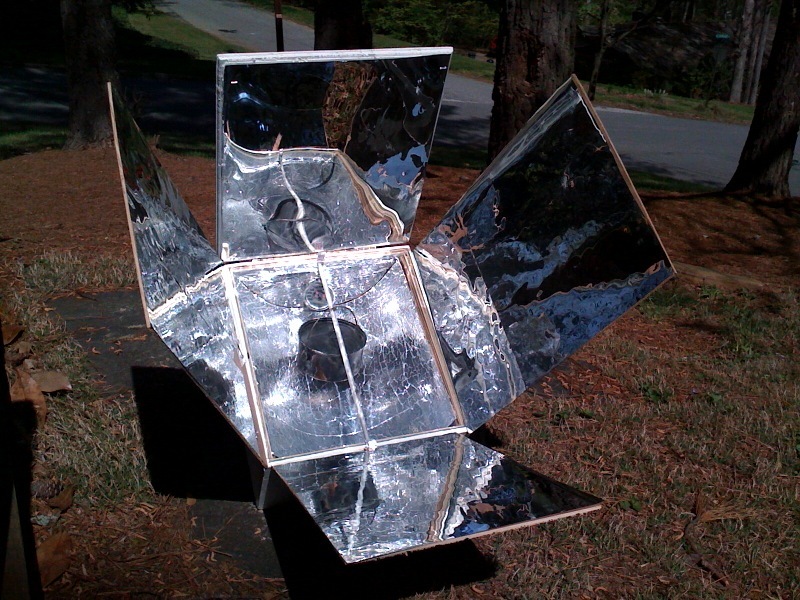 The solar box cooker typically reaches a temperature of 150 °C (300 °F); not as hot as a standard oven, but still hot enough to cook food over a somewhat longer period of time. It should be remembered that food containing moisture cannot get much hotter than 100 °C (210 °F) in any case, so it is not necessary to cook at the high temperatures indicated in standard cookbooks. Because the food does not reach too high a temperature, it can be safely left in the cooker all day without burning. It is best to start cooking before noon, though. Depending on the latitude and weather, food can be cooked either early or later in the day. The cooker can be used to warm food and drinks and can also be used to pasteurize water or milk. Solar box cookers can be made of locally available materials or be manufactured in a factory for sale. They range from small cardboard devices, suitable for cooking a single meal when the sun is shining, to wood and glass boxes built into the sunny side of a house.